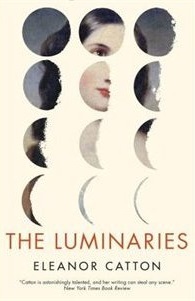 …The Luminaries, Eleanor Catton’s Victorian-style tale of a complicated nineteenth century murder mystery/conspiracy, set in the gold-mining country of western New Zealand. My full review of the 800-plus page novel is here. 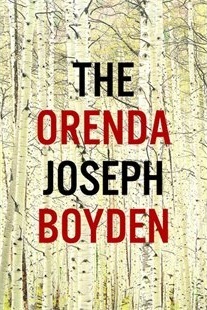 The Orenda, by Joseph Boyden: Another historical story, this one set in seventeenth century southern Ontario, with the warring Huron and Iroquois tribes and the even more ominous arrival of the French in the form of Jesuit priests. The Orenda was this year’s Shadow Giller winner and my personal choice as best Canadian novel of the year. The Hungry Ghosts, by Shyam Selvadurai: As a young Sri Lankan immigrant in Canada prepares to return home to visit his failing grandmother, he flashes back to memories of growing up there — the racial tensions, the pressure to join the dodgy family business and the discovery of his own sexuality. The novel also explores his difficulty in adapting to his new home in Canada. The Lion Seeker, by Kenneth Bonert: A debut novel that chronicles the experiences of a Jewish Lithuanian family who emigrate to South Africa in the 1930s. I have not yet read it but do have it on hand and intend to get to it soon — it comes highly recommended by David whose thoughtful comments are much appreciated by everyone who visits this blog. A Beautiful Truth, by Colin McAdam: The husband of a woman who is depressed because she cannot bear children adopts a baby male chimpanzee, opening an exploration of the relationship between human and animal nature. 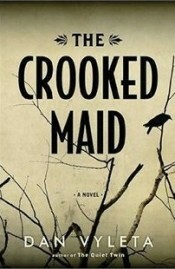 While the premise has no appeal to me, many who have read the novel say that it is very well done. What Catton’s G-G win has certainly done is put another log on the fire of just what is going on with juries, particularly the Giller, in this year’s Canadian literary prize season. Despite her Booker win, Catton did not even make the Giller longlist — indeed, of the five books on the G-G shortlist only Boyden found any Giller recognition at all — and The Orenda was gone when the shortlist was announced. The final fuel will be added next week with the Rogers Writers’ Trust winner — neither Catton nor Boyden are on the shortlist, so there will be no new data for either of those titles. 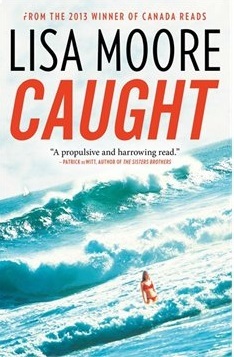 Lynn Coady’s Giller-winning story collection, Hellgoing, is there, as is her fellow short-listed colleague, Lisa Moore, for Caught. Those two are joined by Colin McAdam’s A Beautiful Truth from the G-G and two titles that did not make either the Giller or G-G lists: The Eliot Girls, by Krista Bridge and A Bird’s Eye, by Cary Fagan. I have speculated in comments that the politics of the Penguin/Random House merger and its effect on Canadian publishing could be one explanation for the widely varying lists. All five of the G-G finalists came from Penguin/Random House imprints. Three of the five Giller finalists did — but the surprise winner was from House of Anansi, Canada’s leading independent. Of the Writers’ Trust five, only A Beautiful Truth comes from a Penguin/Random House imprint — perhaps an indication that writers do not think much of the consolidation of Canada’s publishing business. For what it is worth, as a reader here is what my ranking of the various titles I have read would be: 1. 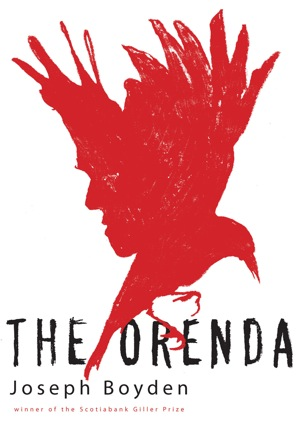 The Orenda 2. The Crooked Maid, by Dan Vyleta 3. The Luminaries. While all three have historical settings, that is about all they have in common — except for being very good books and well worth putting on your Christmas list or considering as a gift for reader friends whom you know. 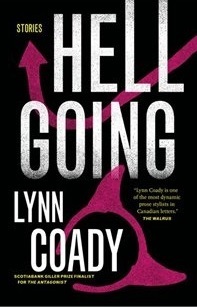 …Hellgoing, Lynn Coady’s nine story collection. While I have not spoken to my fellow Shadow Jurors, I would say we are surprised, perhaps even stunned. On our six book shortlist (including The Orenda) she finished fifth of six, beating Dennis Bock’s Going Home Again by a single point. The collection was fourth of five with Boyden not included — it edged Bock by two points on that ballot. All three of us with blogs have reviewed Hellgoing — you can find Kim’s review here, Trevor’s here and mine here. None of us actively disliked the collection, but neither were we particularly impressed — the stories read just fine, but were not particularly memorable. What is interesting about that similarity of opinion is that Trevor is a genuine short story aficionado, Kim says she doesn’t like the genre (until she actually has to read a collection) and I am somewhere in-between (always feeling guilty that I don’t read more story collections). Three very different starting points, but we all had pretty much the same response. This is a victory of significance for Canadian publisher House of Anansi and their new Astoria imprint. Introduced just this year, Astoria is devoted to short fiction with the promise of publishing at least three titles a year (Theodora Armstrong’s Clear Skies, No Wind, 100% Visibility and Peter Behrens’ Travelling Light were the other volumes in 2013). In a year where Canada’s queen of the short story, Alice Munro, won the Nobel Prize for Literature, Anansi has come up big with its decision to support a genre that many feel is deliberately overlooked by major publishers. All book prize juries (including ours) develop their own personalities and I am not going to speculate on what lead the Real Jury to make this choice — anyone willing to do that in comments is more than welcome and I’ll certainly offer an opinion then. When the original Shadow Jury started its deliberations 19 years ago, we did promise that if our selection did not win the Real Giller we would match the Prize (then $25,000, now $50,000), subject to funds being available. Ann-Marie MacDonald (Fall on Your Knees) chalked up our first debt in 1996 and Wayne Johnston (The Colony of Unrequited Dreams) became the second creditor in 1998. There have been a few others since and they are now joined by Joseph Boyden. Alas, for Shadow Giller winners who did not win the Real Giller, funds have never been available to enable us to make good on our debts. I have no desire to calculate what our total amount owing currently is. For those who did get to watch the CBC broadcast, I think they did an excellent job — viewers were given a very good idea of what each book was about and what each author was trying to accomplish. From my point of view, it was the best Giller broadcast in memory. That’s it for Giller 2013. I promise we will be back (and probably as far off the mark) again next year.